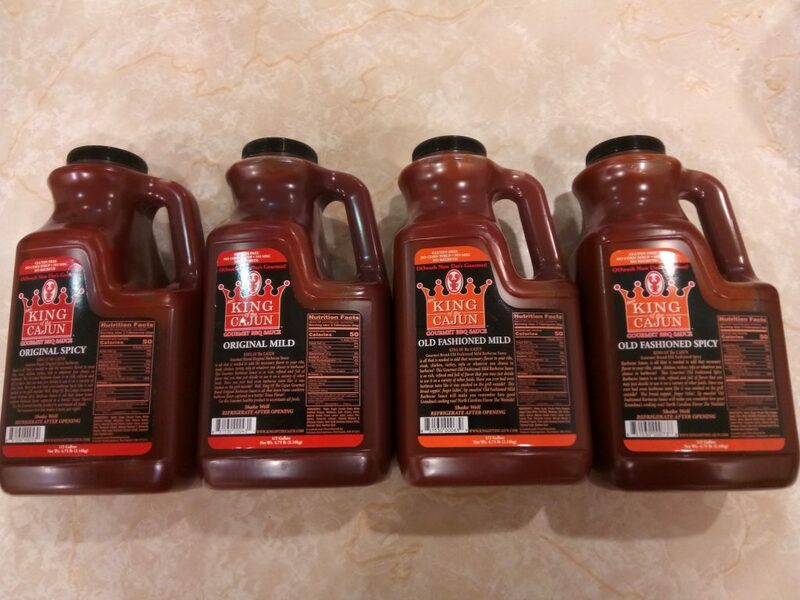 1/2 Gallon Gourmet Barbecue Sauce No Corn Syrup/No MSG! The KING OF THE CAJUN Gourmet Brand Seasoning variety gift-pack comes with all 5 Gourmet Creole/Cajun seasoning so that you won’t miss not a bit of that Louisiana flavor! This Gourmet Cajun/Creole spice gift-set contains the medium sizes of the Cajun/Creole seasoning, the Blackened seasoning, the Cajun Cream Sauce, the Louisiana Mix and the Gumbo File’ seasoning, with four Gourmet recipes which are very simple to follow as easy as #1 Do this, #2 Do that # 3 eat. It is low in sodium and there is no MSG in the product and you can not beat it’s valued savings! Bon Appetite’! The KING OF THE CAJUN Gourmet Louisiana Mix Seasoning is a royal blend of herbs and spices, blended together to create what we know as the authentic taste of Louisiana Cuisine. The combination of Creole and Cajun cooking coming together over the years is cooking that reflects the participation of many people and cultures sharing in the contribution of the melting pot of its creation. Because of this melting pot, Louisiana Cuisine is really American Cuisine at its best! Use this product as a rub for any meat, fish, steak, roast, chicken, pork, etc. This zesty seasoning contains the necessary bite to add excitement to almost any dish. Be creative in your usage and you will find multiple foods to use it in and on. This flavor-packed seasoning will have you running back for more. Don’t hesitate and salivate when you can savor the flavor. Our goal is to simply spice up the world. Bon Appetit! The KING OF THE CAJUN Gourmet Gumbo Filé powder is a special wholesome blend of spices that make up the basis of that down home Louisiana Cajun/Creole Gumbo! This gourmet gumbo filé spice is used to flavor soups, rice dishes, Jambalaya and more. If you enjoy authentic southern cuisine, this is the seasoning that will make your gumbo Gumbolicious! No MSG.